This morning I rode my bike downtown in order to be at my dentist’s office by 8:30. On a great-to-be-alive morning I pedaled along Lake Michigan and, as I do almost every day, realized anew why this is such a great city. Yesterday, Memorial Day, was a hot day in Chicago with the temperature reaching into the upper 90’s, something that rarely happens at this time of the year in the Midwest, and as I rode home on the 151 after narrating the last 90-minute river cruise of the day, it was plenty easy to tell that the beaches had attracted folks in record numbers. And why not? A Monday off, newly opened beaches, and the kind of scorching temperatures that have brought Chicagoans to the coolness of the lake since the city was chartered . . . it all came together in a city-with-the-big-shoulders way. Imagine the amount of trash that the crowds that thronged the beaches from Oak Street north to Fullerton Avenue must have generated yesterday. Watch the 20-somethings making their way to the beach on a hot day, and take note of what they are carrying with them. All the stuff in those back packs, rolling coolers, and oversized carryalls has to go somewhere. By 7:50 this morning as I wheeled along the beach between North Avenue and Fullerton, this is what I saw . . . 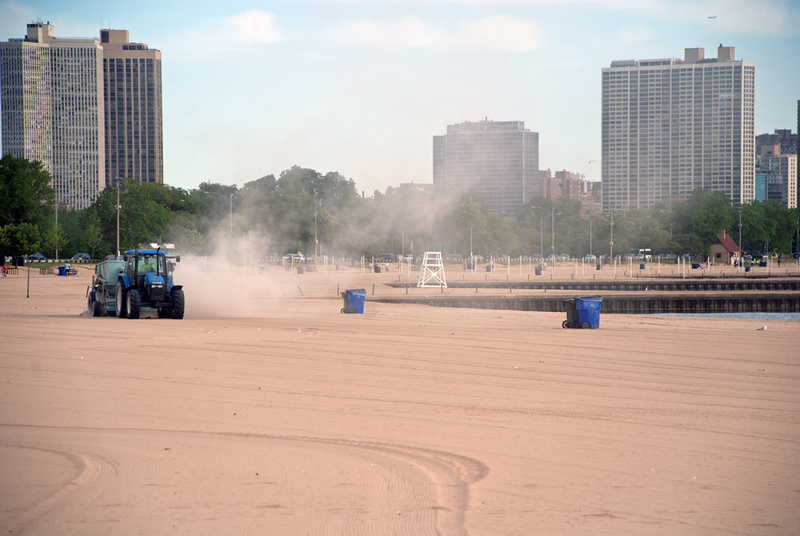 The entire beach had been cleaned with the tractor that was sifting the sand just finishing up its job. A city garbage truck had made it all the way from Oak Street to about a hundred yards past Castaways at North Avenue with just a few more refuse containers to go. The folks in the crew who were spearing all of the loose debris along the Lakefront Path had just about reached Fullerton . . . everything from there south to Oak Street was as clean as if Memorial Day Monday had never happened. How amazing! Before 8:00 in the morning, the entire lakefront had been swept clean after what might well be one of the biggest beach days of the early summer. Last weekend as I chatted with tourists who were in town during Chicago’s NATO strike, I must have fielded the same question a dozen times. In one form or another it went something like this, “Did you guys clean up the city for NATO or is Chicago always this clean?” How good it felt to be able to answer absolutely honestly that, yes, Chicago makes the extra effort to scrub itself up every day before it goes to work. This morning, after an uneventful hour in the dentist’s chair, I got on my bike again and rode south to Grant Park, past Buckingham Fountain, down to Roosevelt Road. Crews were busy planting the flower beds for the new growing season. 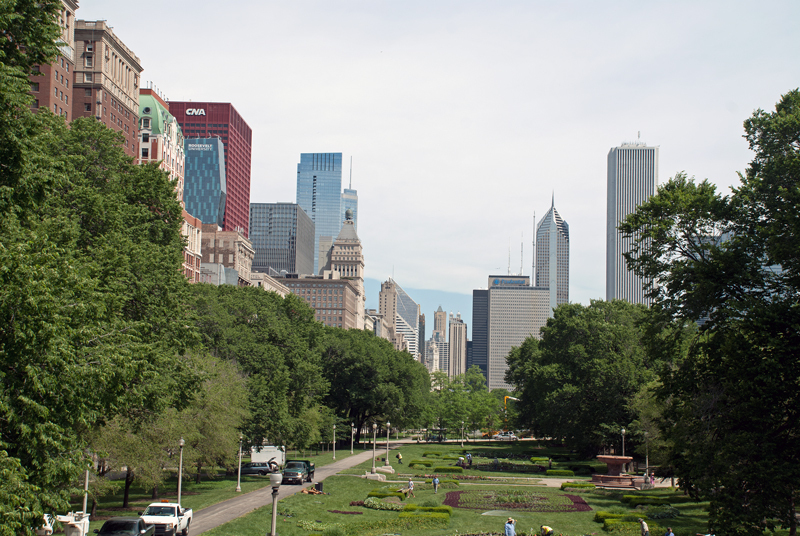 The 319 acres of Grant Park, this great gift to the city from generations past was preparing to burst into bloom. And for the second time today I felt the power and beauty of a city that always amazes. In a pristine park next to a sunlit lake, I looked north toward Randolph Street. 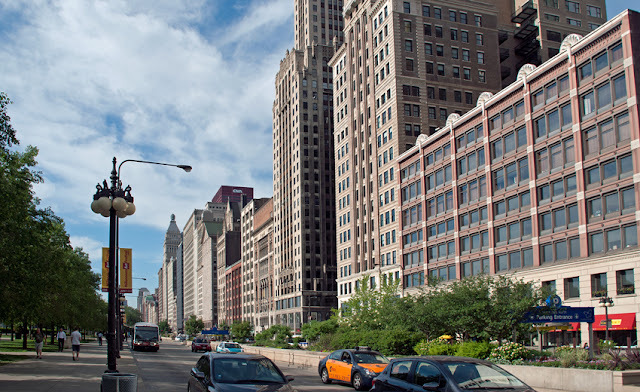 With a train sliding past on the Illinois Central electric line to my right and with the noise of Michigan Avenue traffic to my left, I felt the realness of a city that is, to paraphrase Nelson Algren, the loveliest of lovelies. Your photos are looking gorgeous! (Or, is that just a good looking, clean city?!) How is Dr. Dan? Photo Shop is a big help, isn't it? Dr. Dan does not need to be Photo Shopped, but he seems a bit rushed. Anyway, I'm headed in this afternoon for a filling replacement. Great way to spend a rainy afternoon!